By Jon Tewksbury Posted: November 19, 2018 4:00 p.m.
Thursday last week, students from English 349: Methods in Literary History filled the Administration-Humanities Pit for the inaugural English Research Fair organized by professor Susan Johnston. 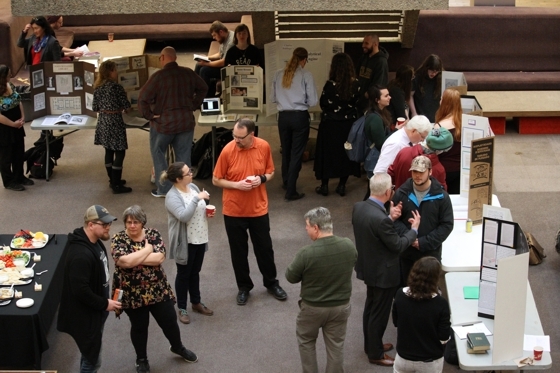 The research showcase allowed students to present their independent, original research. The event is a new take on an assignment Dr. Johnston has been giving out for more than a decade. This year, instead of her eyes being the only ones to see their hard work, she created an opportunity for her students to go public with their research projects. She says this project helps her undergraduate students develop their ability to place events and works of art in context, while also enhancing their proficiency in research and independent inquiry. And for many students, the research they’re conducting extends far beyond the walls of the University. Jessica Leeper, a fourth-year English student, presented her research project entitled Isabella and the Pot of Basil, which compared the interpretation of a 14th century novella to subsequent works through different ages and mediums. The entire class had their research on display at the fair, and Leeper felt the public exposure was a great experience. Leeper, who plans to complete her honours program in her fourth year of the English program, said the research fair will be good preparation for that, and her future. Participating in the fair from outside the Faculty of Arts was Dina Tremblay, a second-year Biology student with an interest in English. Her research centred on Victorian royalty and their historic tour of Canada. When asked about the importance of the research fair, Tremblay was enthusiastic. The Research Fair ties in nicely with the recently announced Social Sciences and Humanities Research Council’s The Storytellers contest, which has just opened to students. The Storytellers challenges postsecondary students to show Canadians how social sciences and humanities research is affecting our lives, our world and our future for the better. For more information on The Storytellers, click here.